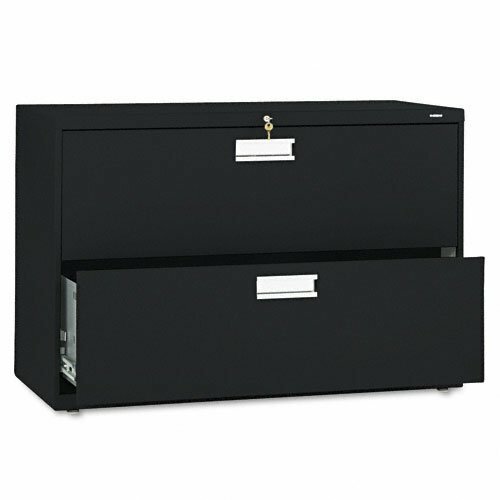 HON Products - HON - Brigade 600 Series Two-Drawer Lateral File, 42w x19-1/4d x 28-3/8h, Black - Sold As 1 Each - Counterweight included, where applicable, to meet ANSI/BIFMA stability requirements. - Lock secures both sides of drawer. - Heavy-duty, three-part, telescoping, steel ball bearing suspension for smooth drawer operation. - Mechanical interlock allows only one drawer to be open at a time to inhibit tipping. - Four adjustable leveling glides help compensate for uneven flooring. Counterweight included, where applicable, to meet ANSI/BIFMA stability requirements. Lock secures both sides of drawer and heavy-duty, three-part, telescoping, steel ball bearing suspension offers smooth drawer operation. Mechanical interlock allows only one drawer to be open at a time to inhibit tipping. Four adjustable leveling glides help compensate for uneven flooring. Drawers include side-to-side hangrails for letter or legal size filing and bright, anodized aluminum recessed drawer pulls, magnetic label holder. HON amp;quot;One Keyamp;quot; interchangeable core removable locks. Color: Black Overall Width: 42amp;quot; Overall Depth: 19 1/4amp;quot; Overall Height: 28 3/8amp;quot;. If you have any questions about this product by HON Products, contact us by completing and submitting the form below. If you are looking for a specif part number, please include it with your message.